Hardcover, 8.5 x 9.5 in. / 156 pgs / 100 color / 20 bw. Edited by Gisbert Porstmann, Johannes Schmidt. 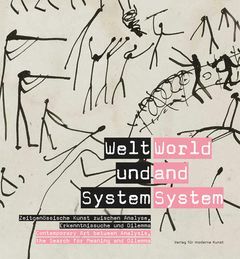 Text by Thilo Gross, Robert König, Stefan Schmidt. World and System takes A.R. Penck's System Pictures series (inspired by the idea of images as a global language) as a springboard to examine how contemporary artists such as Mark Dion, Charles and Ray Eames, Öyvind Fahlström, Mark Lombardi, Frank Nitsche, Jorinde Voigt and others devise complex systems of their own. FORMAT: Hbk, 8.5 x 9.5 in. / 156 pgs / 100 color / 20 b&w.